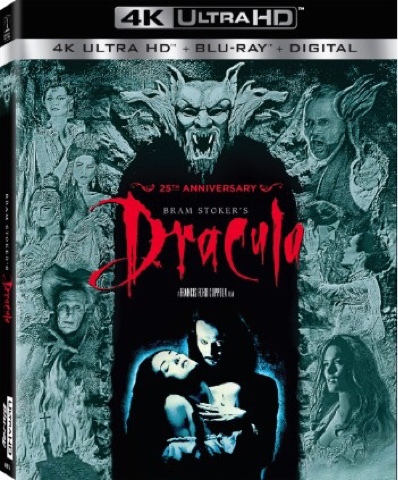 CULVER CITY, Calif. (July 14, 2017) – BRAM STOKER’S DRACULA, the Academy Award® winning* sensual horror classic, celebrates its 25th anniversary by debuting on next-generation 4K Ultra HD for the first time on October 3 from Sony Pictures Home Entertainment. The release also includes the existing Blu-ray™ with hours of thrilling and insightful special features. Fully restored in 4K resolution and presented with High Dynamic Range (HDR) and Dolby Atmos audio, BRAM STOKER’S DRACULA follows the devastatingly seductive Transylvanian prince, Dracula (Gary Oldman) who travels from Eastern Europe to 19th century London in search of human love. After centuries alone, the charismatic Dracula meets Mina (Winona Ryder), a young woman who appears as the reincarnation of his lost love and the two embark on a journey of romantic passion and horror. BRAM STOKER’S DRACULA has a run time of approximately 128 minutes and is rated R for sexuality and horror violence.